I have been silent for a while now. But I have not been asleep this whole time. A few days ago, I finally finished a small playable concept demo for the game. There is not much yet, but I am planning to expand the demo to include several rooms and the introduction of at least the majority of the mechanics that the game will include. Been a while since my last post. I took a bit of a break to work on my art, since many of my games tend to suffer from having a poor first impression due to poor art. If you look back at my previous post, you can see what the initial art for the main character looked like. Still working on adjusting the details so that they don’t disappear when shrunk further down. Especially the eyes. Hopefully I will have some animated examples to show soon. Haven’t had much new to post for a few days, as I am currently working on some of the artwork. I’ve finished a simple sprite for the Princess though, so that’s progress at least. So far I have a single frame jump, a two frame run, and a three frame spellcasting animation. I will hopefully be able to refine the sprites a bit further as I continue making progress on the game. Her character design is not particularly unique at this point unfortunately. I’m hoping to be able to change that.. though I am limited by my lack of skill in the art department. Right now though, for the sake of clarity, I have a mostly red/pink/tan color scheme to make her face and arms easily distinguishable from her dress and hair. This time, I’m going to be talking about choice and consequences in the game. One major complaint against the Damsel in Distress trope that I notice is that it robs the female character of agency. But, do any characters really have agency? What is the hero going to do, NOT rescue the princess? The only character with any real agency in a game using the Damsel in Distress trope is actually the villain, who sets everything in motion by kidnapping the princess in the first place. The villain chooses the battle field, the timing, and can abandon ship at any time. The hero has no choice but to meet the villain head on, even if he has little chance of success. These kinds of games are not generally known for having a “give up and go play some golf” button. Normally, a game that does give the player some agency tends to do so via dialogue options with a clear “pick this for evil, or this for good” or an arbitrary “good action, bad action” morality scale. In this game, you will have numerous endings depending on choices you make during actual game play, largely unprompted. For one thing, you can choose to just let yourself be rescued. If you stay in the dungeon cell for a certain length of time, you will await your rescue rather than escaping. In this case, you will have to play the game backwards as one of several heroes in an attempt to rescue the princess. This route will not be explicitly mentioned in game, so it will hopefully be an entertaining surprise for anyone who decides to just do nothing to see what would happen. But beware; not all the heroes are pure at heart. As the nobler, but weaker heroes die off, the remaining ones may not lead to such a happy ending, and if they all perish, it will be game over for our princess. I have a few other choices the princess will have to make as she makes her way through the castle, but some are still being worked on and others I would like to keep as a bit of a surprise. One thing to be certain though, this is one protagonist who isn’t lacking in the agency department. One of the features of the game that I am going to be focusing on are dynamic game overs. This is something I did on Bob the Archaeologist a while back, where the narrator would have various lines he would say upon Bob’s death. Usually making fun of him. Rather than being a mocking narrator though, in this game each unique death will be accompanied with an image and story to describe the ending. The reason I want to do this is to highlight the risk that the main character is taking. I don’t want this game to feel like the princess choosing to rescue herself is a consequence free action that you repeat until you get it right. The princess is not a warrior; as I said in the first post. So, taking on the task of rescuing herself comes with a personal risk she would not normally have to face if she waited for her rescue. So, I did not want to gloss over that danger by having consequence free limitless continues. There is no shame in not being the most physically powerful person in the world, so I also don’t want to end up giving the impression that anyone who needs help is somehow inferior because of it. At the same time, I would not want to bore the player with lengthy game over screens every single time they die, so I’m probably going to offer three options. One which gives you the game over screen each time you die, one that only shows the game over screens the first time you see a new one, and one that skips the game over screens entirely. So, a couple days after I announced my idea for this game project, Anita Sarkeesian went on the Colbert Report for an interview and basically said my idea during it. That is a bit unfortunate for me; as if this project manages to be at all successful the assumption would be that I got the idea from watching her interview on television. I suppose it is lucky that I did make a post about the idea right away this time. As far as Anita goes, I have to say that I am not a fan of her work. She does far too much finger pointing and complaining, with not enough constructive criticism or suggestions on how to make things better. One can only say everything is bad for so long before you start to get the feeling that a person is impossible to satisfy. Since the mistreatment of females in gaming has been a pretty hot issue lately, I figured that making a game subverting a common trope rather than just complaining about the trope being wrong would be a more productive move. There is nothing inherently wrong with the Damsel in Distress trope. The problem is more that we do not have enough games that subvert, or invert the trope yet to balance it out. In my opinion, punishing people for not making better female characters will just lead to an avoidance of female characters to avoid controversy. I feel like the solution is more to praise and reward people who make good female characters. I have my fingers crossed pretty hard that I am able to actually make a decent female character in this game. It’s a pretty ambitious project, and I’ll be posting about more of the details fairly regularly now that I am not under such a heavy time crunch. In Distress is going to be a subversion of the typical Damsel in Distress trope. In this game, you play as a princess who has been kidnapped by an evil wizard planning to use his magic to brainwash her into becoming his wife, thus securing a place on the throne once the King is conveniently disposed of. Desperate to get his daughter back safely, the King has promised to reward whoever can rescue the Princess first by naming them heir to the throne. Upon hearing about this decree the Princess realizes the only way to keep the kingdom from falling into the hands of any random guy with a sword and more muscles than brains, she will have to rescue herself. Escape will not be easy. The Princess spent her time learning how to properly rule a kingdom, not the basics of sword play. On top of that, the castle is full of traps, and the Wizard’s minions all waiting to catch her off guard and put an end to her rebellious nature. Luckily, the Princess is not entirely defenseless. With the help of a fairy, she has untapped her own magical potential, and will be able to use a variety of spells to help her on her way through the castle. Will you be able to escape the castle with both your mind, and body intact? I don’t think I have to search very hard to find someone who will agree that Alexander IV is unfun. In fact, of the number of people who have beaten Alexander, almost all of them say in the same post as thier victory post that they *never want to fight him again* often even saying they did not feel any sense of accomplishment at all. There are plenty of difficult games, and difficult bosses out there. Many that take far longer to beat than Alexander that end up being considered to be pretty great bosses. I would like to examine the reasons this boss fails in a design perspective. Hopefully a refreshing departure from what I imagine are a fair number of “uhg this boss is impossible Nerf Now!” posts that this boss likely brings about. So first, why does a player fight an optional, difficult boss? Here are a few reasons I can think of off the top of my head. 1: The sense of accomplishment. Unfortunately, Alexander IV fails to on every single one of these. You might assume it provides number 2 at the very least, but I’ll get to that in a moment. I’ll start with #1. A sense of accomplishment is not merely feeling good that you won. It can also be feeling good that you made progress. This is often why bosses in JRPGs tend to take multiple forms, while many other games with Boss Battles will have bosses get battle damage or enrage once their health hits certain levels. This is a visual indicator that you are making progress, and often is accompanied by a change in behavior to learn and adapt into your strategy. It is entirely possible to spend hours on a good boss fight, inching closer to victory with every attempt until you finally succeed, because each fight that you manage to push forward to the next stage in the fight rewards you with some sort of aknowledgement of your progress. So, What happens with Alexander IV? The battle starts off, and he moves around simi-irradically, either chasing, circling, or evading your character at random, spawning minions fairly regularly, and occasionally stopping to spit fireballs in every direction. Then, about at the mid point, he does exactly the same thing. And towards the end, he continues to do exactly the same thing. The battle does not in any real way aknowledge the player’s efforts. Dying without managing to land a hit looks exactly the same as having only one hit left to land on him. The only sense of accomplishment the player recieves is therefor only the bare minimum amount from finally winning. A player looking for a good challenge wants to really put their skills to the test. The problem is, of course, that challenge is not the same as difficult. Case in point, a jar someone glued the lid onto is difficult to open. It is not challenging. In order for a game to satisfy a normal gamer’s desire for a challenge, the player needs to feel as though they are learning from the experience in some meaningful way. If you have played this very game for a while, and if you have not already, open up a new profile, and play as the first character. I can almost guarentee that you will get further than you did the first time you played. Most of this game is challenging. You are constantly learning how to better evade attacks, and land blows safely in order to survive. Look back at Alexander IV though. What do you learn from fighting him? What really? Accounts I have read on successful kills usually have something in common. They often mention that the AI “finally behaved the way they needed it to”. Many players who succeeded at defeating the boss do not actually attribute their victory to developing a greater level of skill; but rather to dumb luck. I will say, this boss is not a pure luck boss. You will not beat him without a combination of both a high amount of skill, in addition to a good amount of luck. The way the boss is presented however, it does not feel like your skill has any affect on the battle at all. Once you are able to proficiently avoid the adds and fireballs, any additional level of skill gained while fighting this boss has far less impact than the behavior the boss decides to exhibit in a single round. This leads to a situation where the player is gradually improving… but the amount of damage inflicted before dying is so random it feels like no progress at all is being made. Which also ties back to the previous number on the list. Another strong motivator for players is the reward for completinig a bonus challenge. Achievements, New items, New powers, or secret endings are all great motivators. I think this one is fairly self explanitory. So, going straight to it, how does Alexander IV hold up? Well, you get an achievement for beating him…. that was added in free DLC when he was released. So, players who had been playing since before the DLC lost their 100% completion, and were less being rewarded, and more trying to get back what they had lost. That is less applicable for players who joined up post DLC, of course. The other reward, is being one step closer to being one step closer to unlocking a new class. Even in the best case scenario that you fight him last, you still do not get an actual reward because there is guarenteed to still be one more boss fight left before you get that reward. This makes the experience of fighting this boss on it’s own less like a rewarding experience, and more like an exceptionally tedius chore on a to do list. It is always fun to watch certain boss fights. Even if you could never come close to beating them yourself, you can appreciate the amazing amount of skill the player has when they accomplish it. TouHou is a good example of this. Somehow the player is able to navigate a maze of bullets that fill almost the entirety of the screen, and even someone with only a vague passing knowledge of the genre can understand how difficult the battle is. I’ve looked up several videos on fighting this boss during my attempts to fight it. And honestly? It always looks easy. This goes back to the AI “behaving it’s self” problem mentioned earlier. Battles that you win are generally the battles where the AI essentially “goes easy on you” after you have developped enough skill to take advantage of it. That does not make for a very impressive looking feat. This of course leads to a final situation where the boss simply does not satisfy any of the player’s needs. In a game, the biggest goal for design is fun. A boss that leaves the player unsatisfied and thankful that they *never have to do that ever again* is not a boss that was designed well. 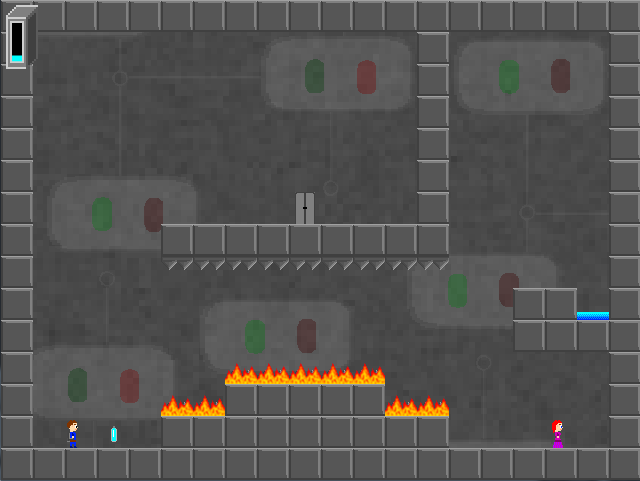 I’ve been working most of this month on a puzzle platformer that I am currently calling “Fire Everywhere!”. 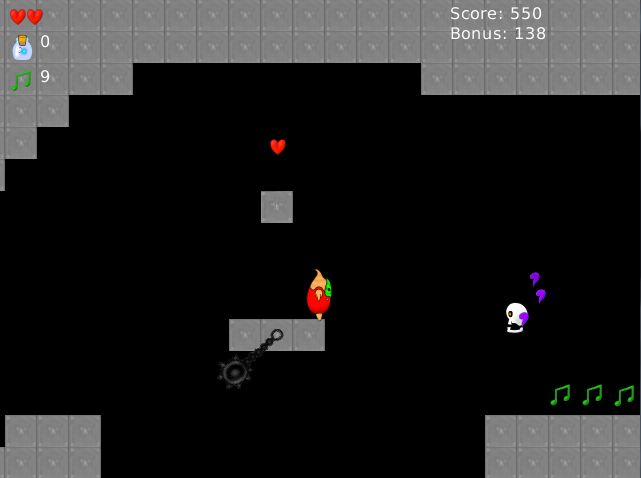 In this game your objective is to rescue people from each burning room, and get out alive. This one is actually giving me more trouble than usual with level design. Being able to jetpack around with a lot of water makes most designs far too easy, while restricting the supply of water makes it overly unforgiving. Hopefully I will still be able to finish before the end of the month. Progress is continuing fairly smoothly for Makario. Looking to see if I am still competition free, it seems a couple other people have gotten the same idea (no real surprise) over the last few weeks. One was a fake game, which is a relief, another is a screenshot of a game concept. We look to be taking different styles though, so hopefully our shared presence won’t be conflicting. The game is getting closer to completion. The spikey balls would be a lot better though if rotation didn’t pixelize them. I’m not seeing any way to fix that so far, but I’m hoping I can figure it out before finalizing the game.